If you are a learning to drive you probably struggle with steering and maintaining the correct position on the road when you first start to drive. This is often noticeable when driving around obstacles such as parked cars or even bends in the road. Some of the difficulty can be caused by your steering technique or grip on the wheel, however steering involves using more than just your hands. Your driving lessons with Eclipse Driver Training always have a strong emphasis on observation skills. Here our expert driving instructor provides a simple method to improve your driving that you can practice with your supervising driver. As a learner, you may find when driving around obstacles you are looking just in front of your car or at the obstacles you want to avoid. For some very low speed manoeuvring in confined areas this may be effective, however at normal driving speeds it is important to look where you want to go, not at what you want to avoid hitting. The term target fixation refers to focussing on an object so intently that you unintentionally steer towards that object. In the example of a parked car, this may cause you to steer towards and hit the car. Your focus should be on the line you need to take to safely drive around the car. Don’t focus on the car you are avoiding. Look at what you want to hit and hit the gap, not the parked car. While your main focus is well ahead in the direction you want to go, your peripheral vision is taking in the rest of your field of view. This gives you feedback about what is happening to your sides. 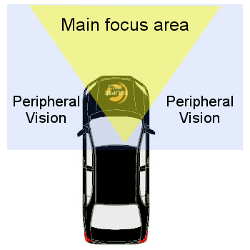 As you gain more driving experience, you will find your peripheral vision improves and helps your hazard perception skills develop to a much higher level. During your required 120 hours of driving practice, it is important to be constantly aware of where you are looking. This includes what is happening in your peripheral vision. The more you concentrate on looking where you want to go and not at the obstacles you want to avoid, the more natural it will become. You will also find with more practice you are able to notice hazards sooner and be better prepared to take appropriate action to avoid dangerous situations. Before you know it you will be spotting potential hazards well in advance and ready to start preparing for your driving test. We provide quality beginner driving lessons throughout Melbourne western suburbs. To help you get started you may find the Road to Solo Handbook provides valuable information for new drivers. And make sure your supervising driver is well prepared with our tips for supervising learners. Send us an SMS or Click-to-Call 0409 315 075 or send us a message and we will show you how to take your driving to a whole new level.